Here's my Thanksgiving miracle. 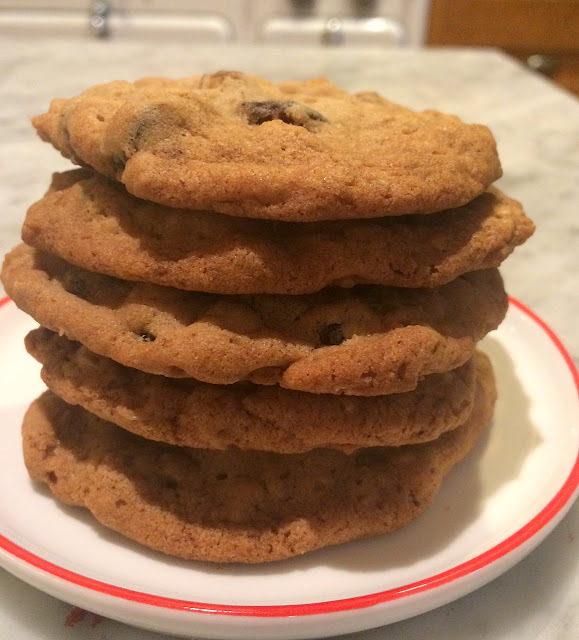 After making this recipe a few weeks ago, I misplaced the recipe card -- and could not find it anywhere. But then, this morning the DH mentions casually that I'd left a couple of recipe cards next to "his" new chair, and bingo, there it was! I'm grateful for many things this Thanksgiving, not least of which is finding this recipe (which I'll make today, if I have the time and oven space). 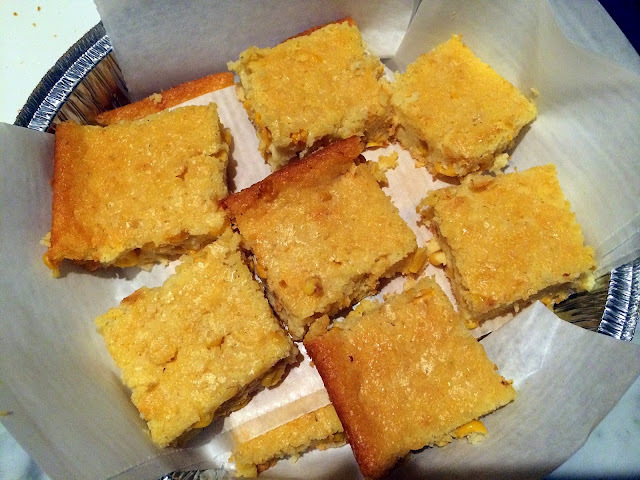 It is simple cornbread, moist and flavorful, with a lovely texture, especially if you use a coarse grind of cornmeal. 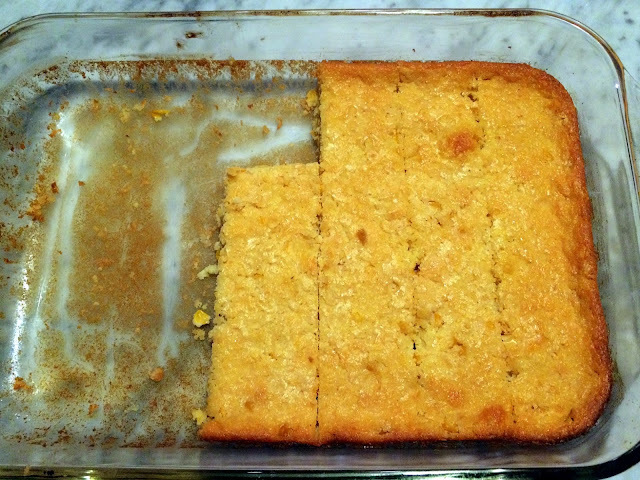 This makes way more servings than two, but perhaps it was meant to serve farm hands, or cowboys. 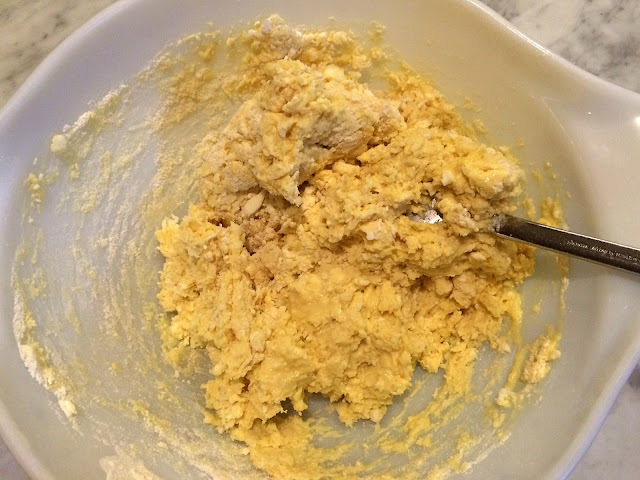 Here's the mis en place except for the butter, which I forgot here, but not in the batter. 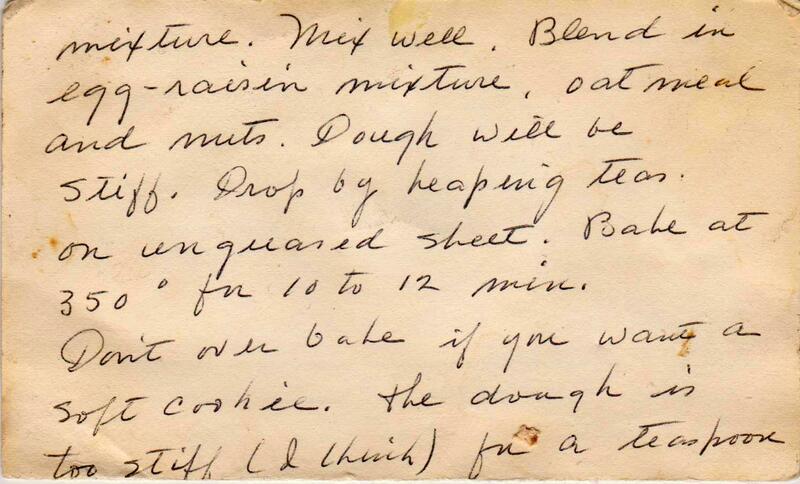 The vintage recipe was simply a list of ingredients, but I've written out the method I used below. Unsure of the pan size (but guided by the "for two") in the title, I used an eight-inch round pan. 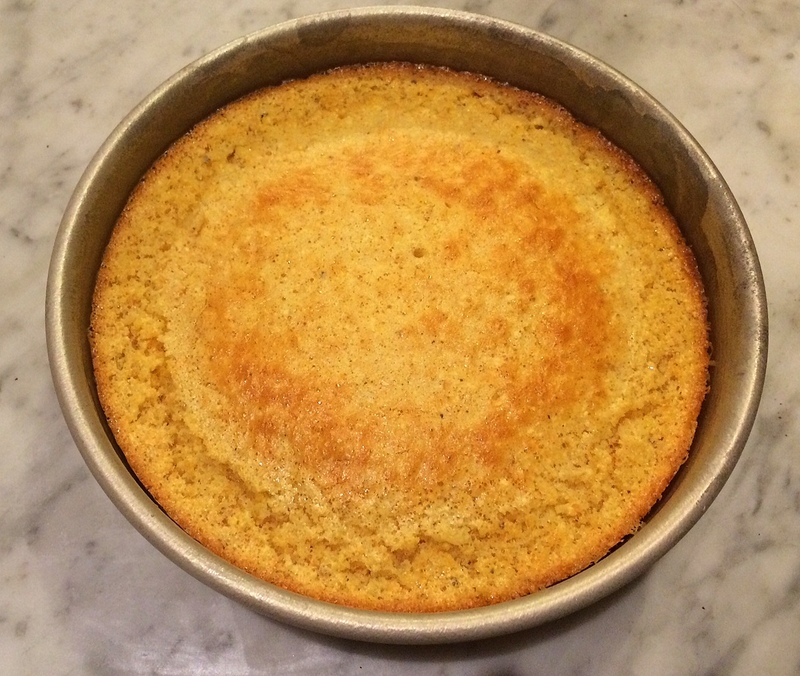 The top should be golden brown when done. 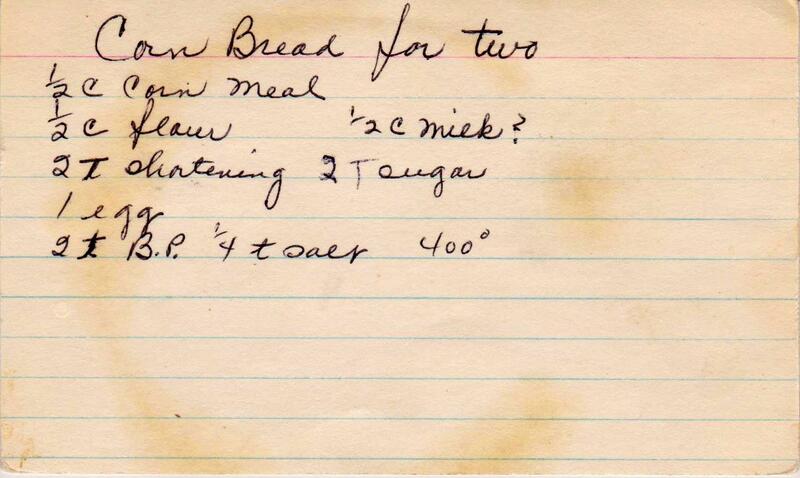 The rather cryptic recipe card below. 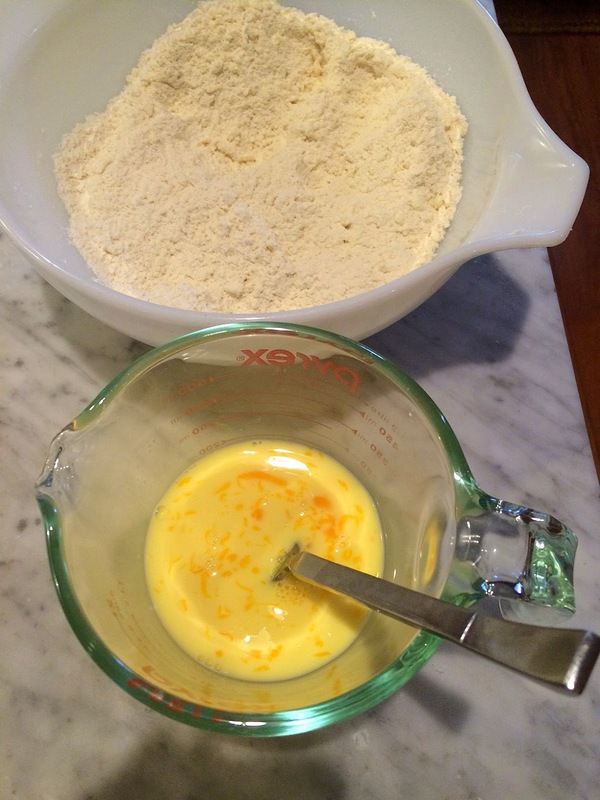 In a medium bowl, blend dry ingredients together. We're smack in the middle of baking season (which runs from October through December), a fact I learned on a tour of the Jiffy Factory in Chelsea, Michigan, this summer. 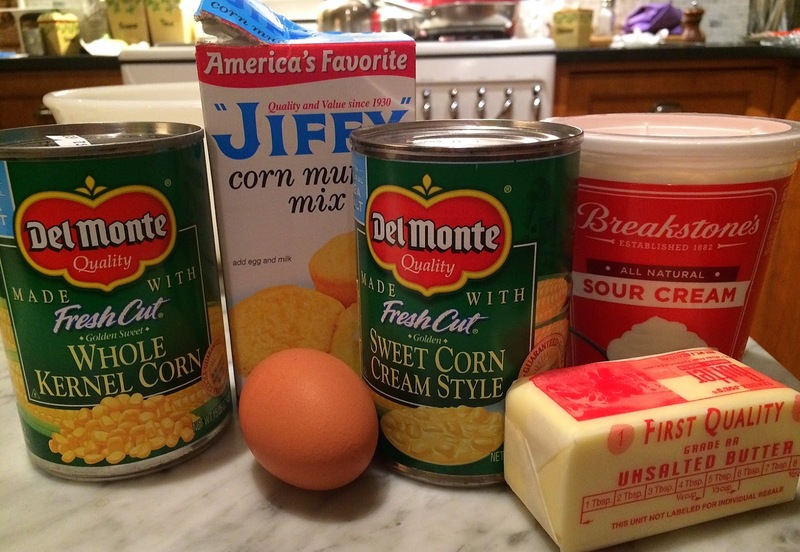 That day, I also learned that my family's treasured recipe for "corn casserole," a staple at Thanksgiving for generations, was in fact created by Jiffy and called Spoon Bread Casserole. Oh, well. 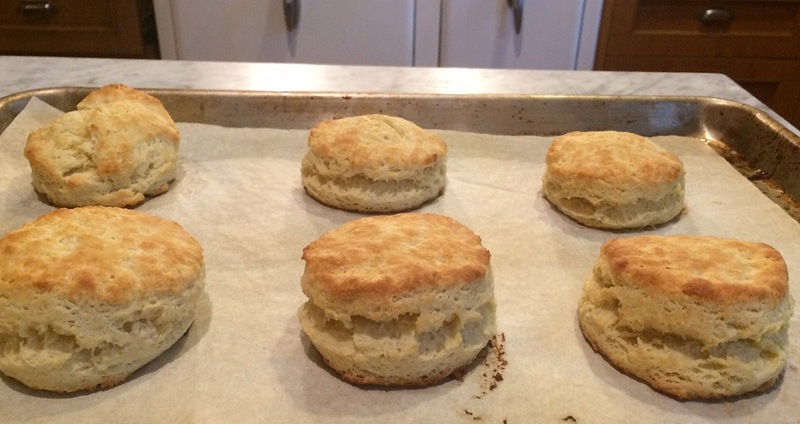 Just don't tell The Guardian, the London paper, which included my recipe last year in a Thanksgiving wrap-up of recipes across America. 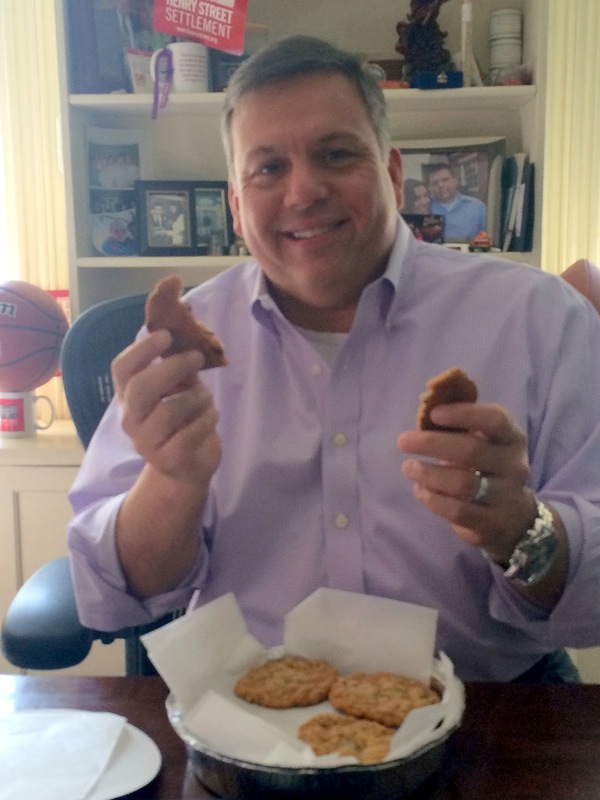 And while I generally eschew packaged food, I make an exception for Jiffy. And you will too, once you read about it here. 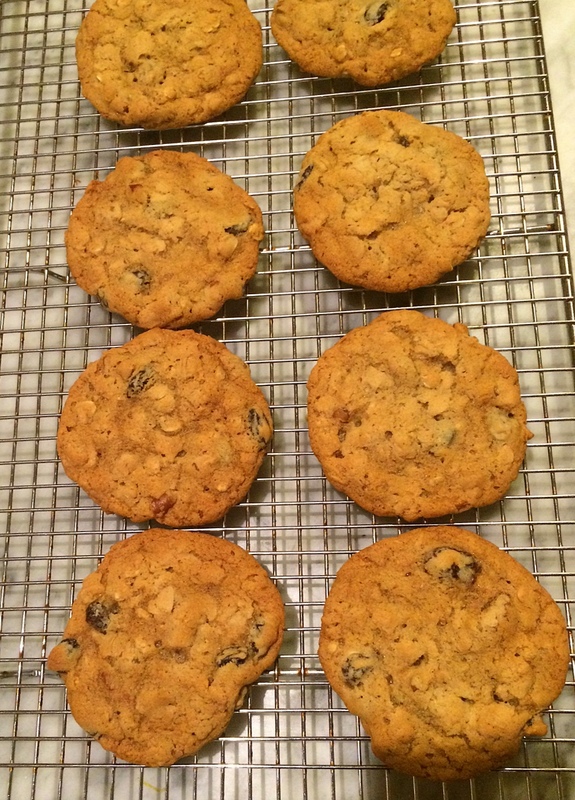 It is a tradition, and also very, very easy and universally loved by all who try it. 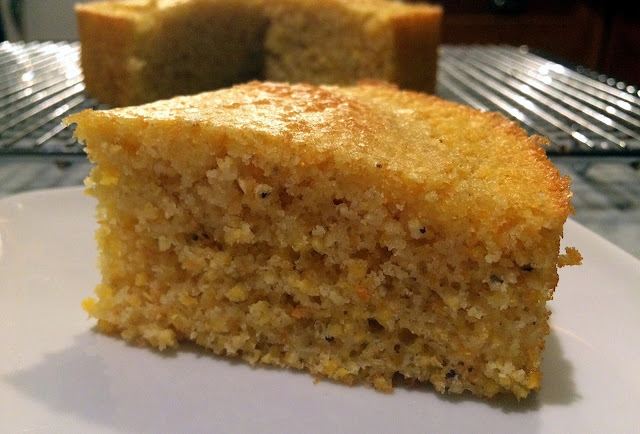 The sour cream eliminate the dryness that is too common in cornbread, and the two types of canned corn add sweetness and texture. 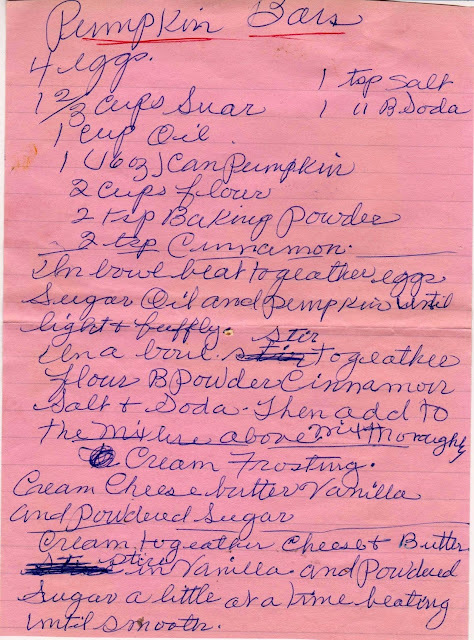 Every year that I make this, I frantically call my cousin Debbie for the recipe, usually on Thanksgiving morning. (Apparently I collect the vintage recipes of other families, but not my own). The mise en place is below. Bake and enjoy. 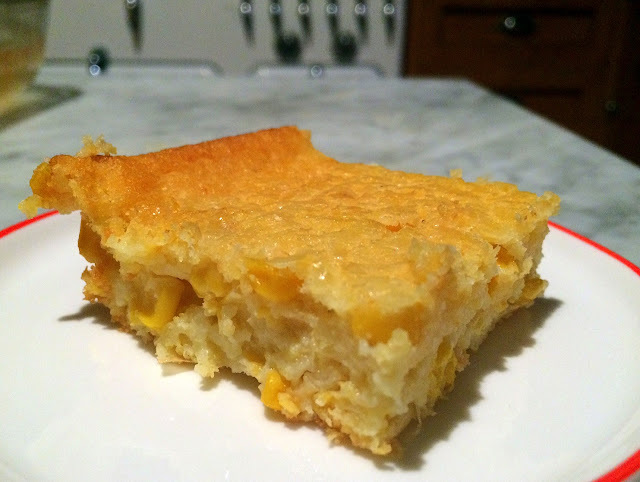 This recipe makes a lot -- the casserole is so rich that you can serve rather small pieces. And if there's any leftovers, your work colleagues will appreciate them. 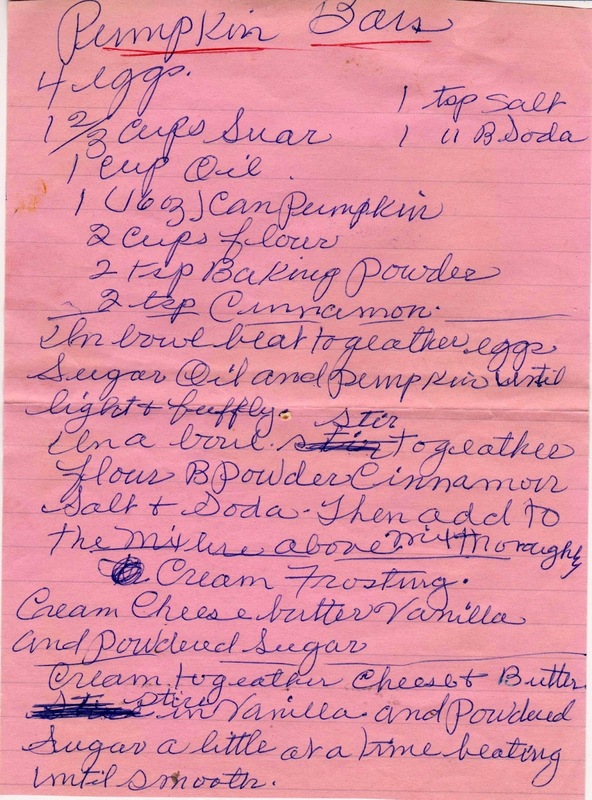 Below is the recipe direct from Jiffy. I also recommend a tour of the plant, if you're ever in the area. It's quite old fashioned, and rather charming. 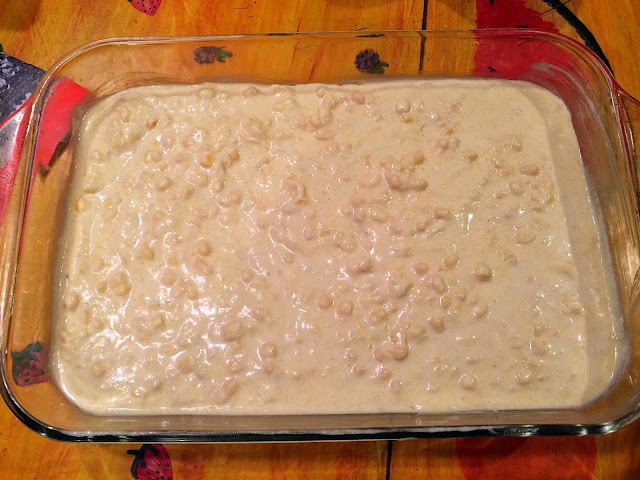 Pour margarine or butter and corn into dish. Blend in sour cream. In separate bowl, beat eggs and stir into casserole. 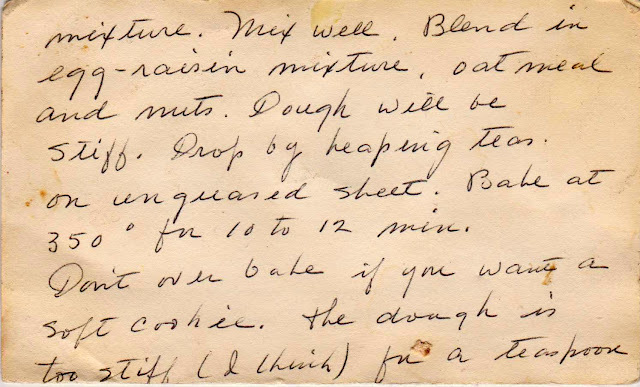 Add muffin mix. Blend thoroughly. Bake 35 - 40 minutes or until center is firm. The pumpkin craze that began last month shows no signs of abating (and quite frankly has gone into overkill, what with pumpkin flavored Oreos, pumpkin burritos from Chipotle, and other similar "delights"). 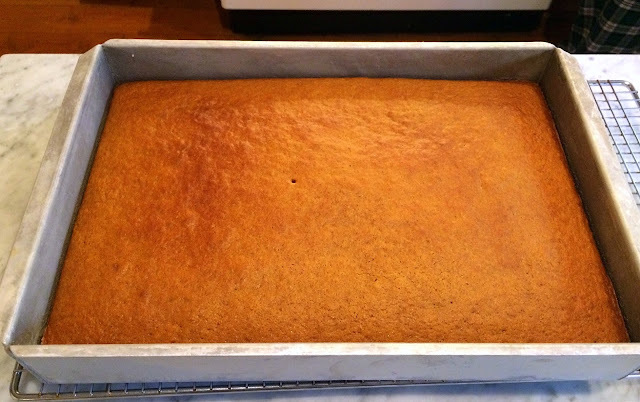 But pumpkin is good, if not bastardized, and this light, moist and delicious pumpkin cake from a vintage recipe showcases this seasonal fruit in the best possible way. It's very easy to prepare, keeps fresh for days (on account of the oil) and perfect for your Thanksgiving company. 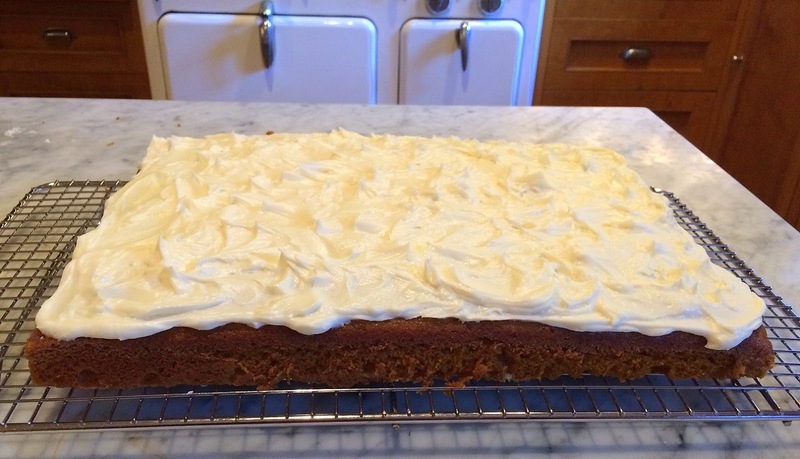 I made this Sunday for my friends Karin and Jim -- and Karin (who is a very discerning eater and big fan of pumpkin pastry) declared it among the best pumpkin cakes she's ever had. Start by combining the wet ingredients in a stand mixer (or use a hand-held mixer). 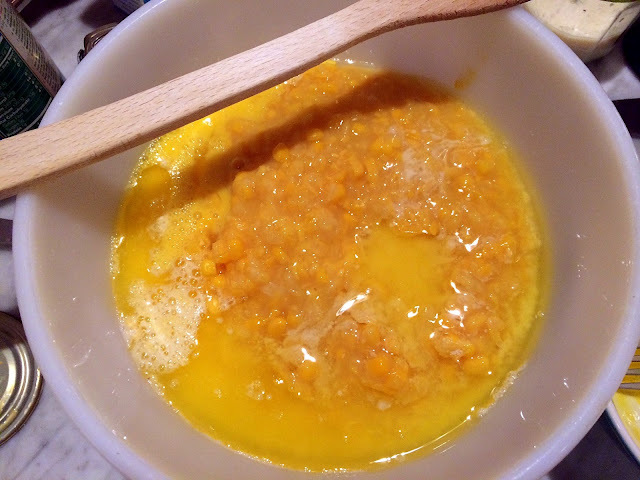 Meantime, combine the dry ingredients in a separate bowl. Blend together and pour into a greased and floured 9 x 12 inch pan. 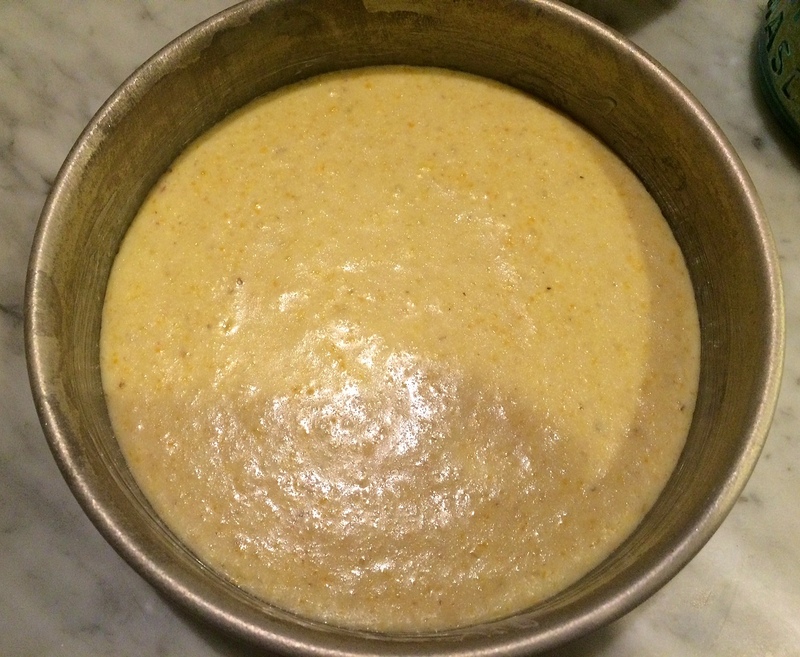 The batter is thick, so using the back of a spoon, spread it to the edges. Bake and cool. 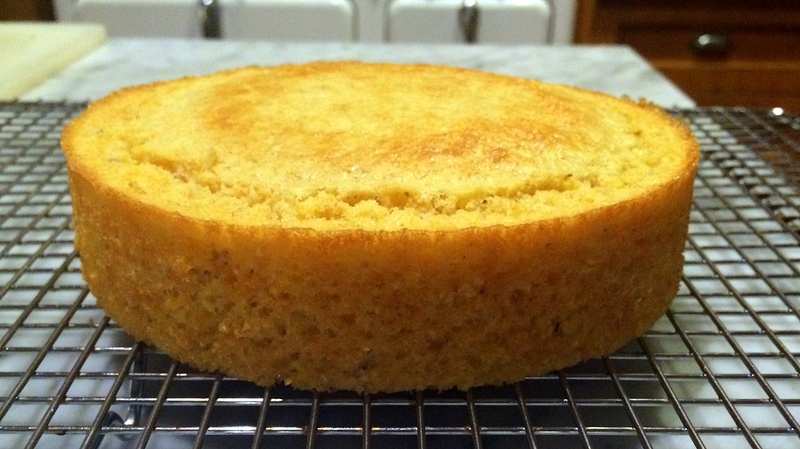 You can turn the cake out from the pan (or not). I was serving this to company, so went the extra step. 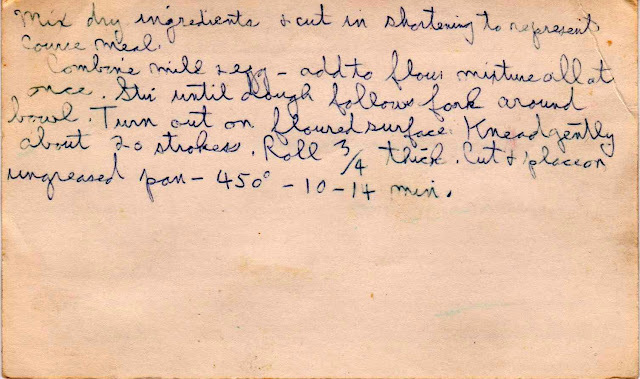 You'll not that the original recipe is rather incomplete -- no baking temperature, pan size, and amount of ingredients for the frosting, so I wrote the recipe (with the missing information) below. The original recipe calls for a 16-ounce can of pumpkin, but these days only 15-ounce cans are available, but it doesn't make a difference. 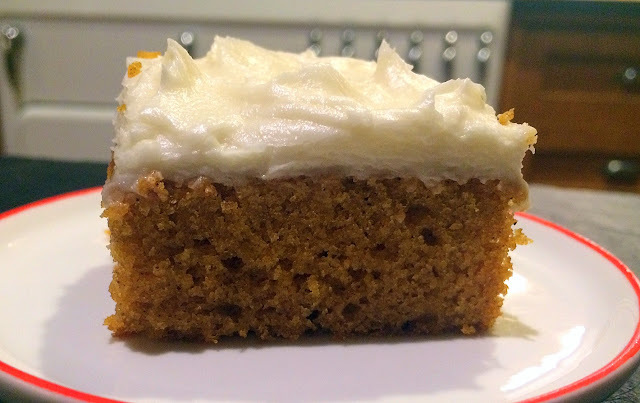 It is also titled Pumpkin Bars, but trust me, this is a cake. 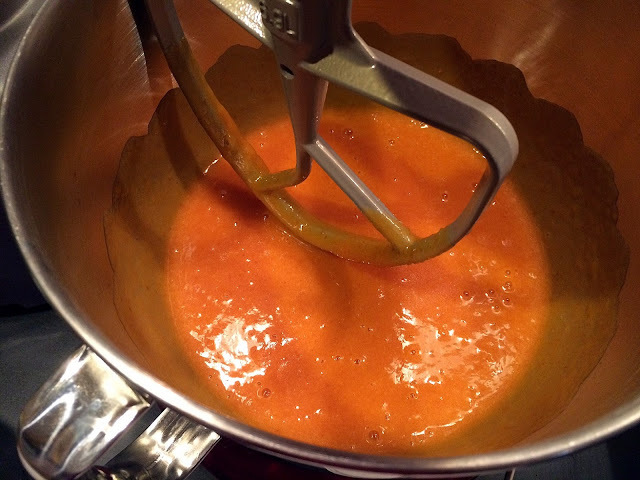 In large bowl, beat eggs, sugar, oil and pumpkin until well blended. 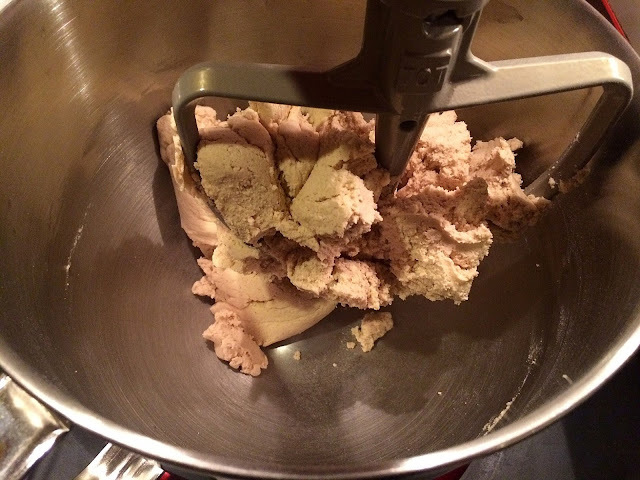 In a small bowl, stir together flour, baking powder, cinnamon, salt and baking soda. 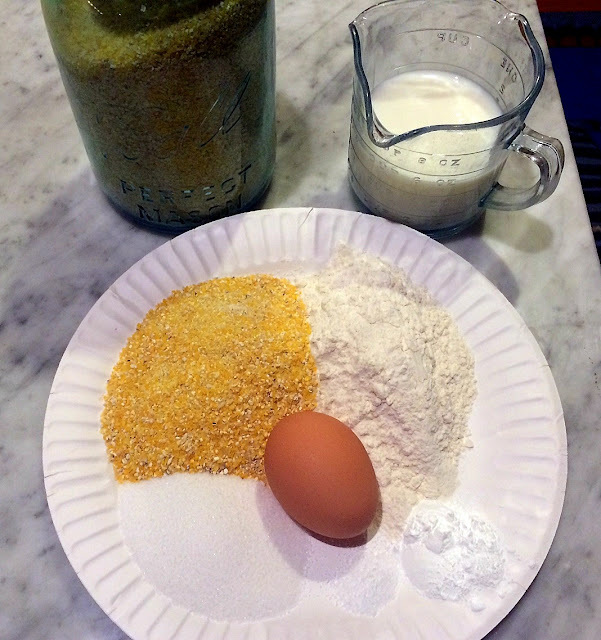 Add dry ingredients to the large bowl and mix until combined. 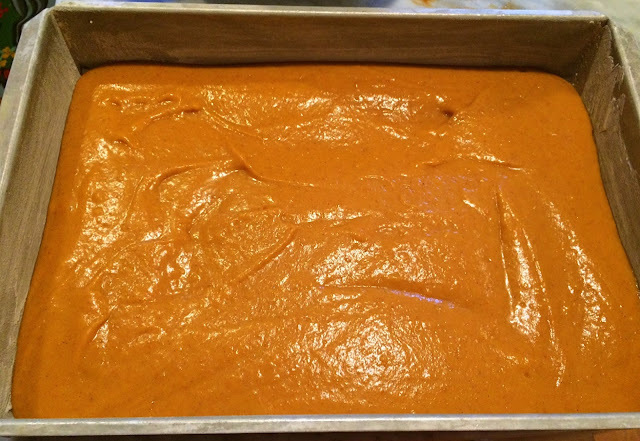 Pour into prepared pan, spread to the edges and bake for about 30 minutes or until a tester comes out clean. In a stand mixer (or using a hand mixer) combine butter and cream cheese. Add confectioner's sugar in batches, combining well between each. 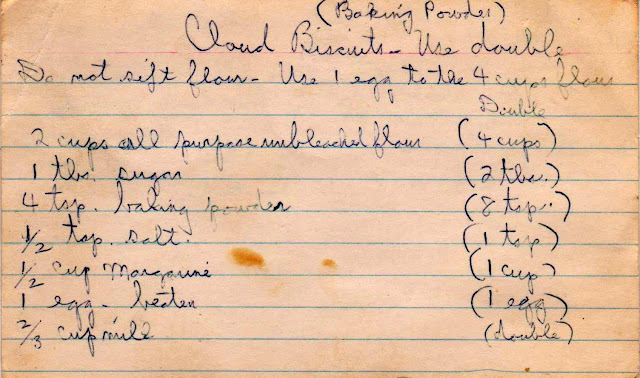 There seems to be a biscuit revival afoot, though I'm not sure why these simple and wholesome baked goods ever fell from favor. 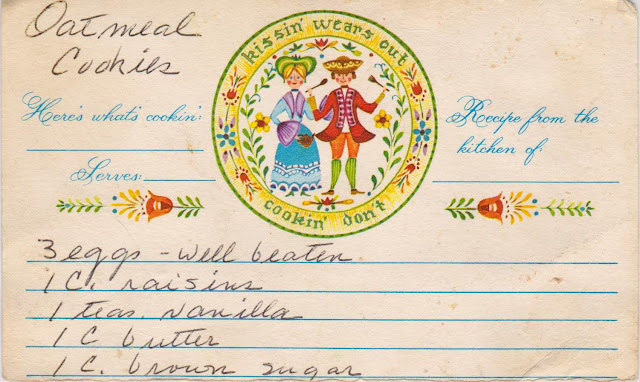 They hearken back to a simpler era, when housewives would just throw these together, year round to accompany a meal or, in the spring, as a base for macerated strawberries to create strawberry shortcake. I love a good biscuit and so have tried nearly every vintage biscuit recipe in my collection, but few come close to this one. 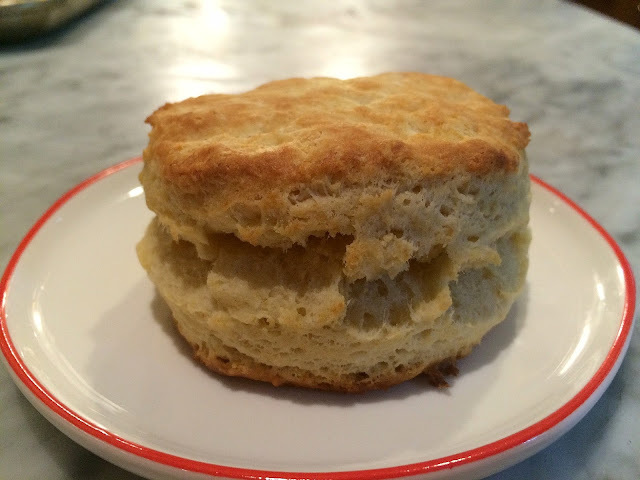 The appropriately named Cloud Biscuits give a very nice rise, and the texture is divine. Plus, who could resist the name? (As someone who earns a living in marketing, I applaud the recipe's author who titled this so brilliantly.) These are basically baking powder biscuits (isn't cloud biscuits so much more appealing? 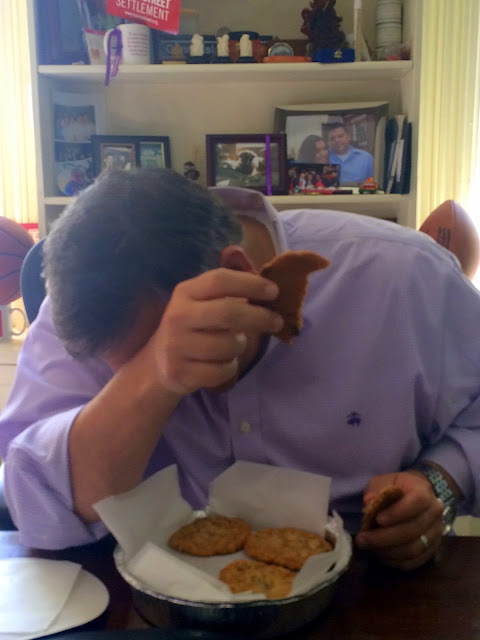 ), but they also include an egg, making them a bit richer. 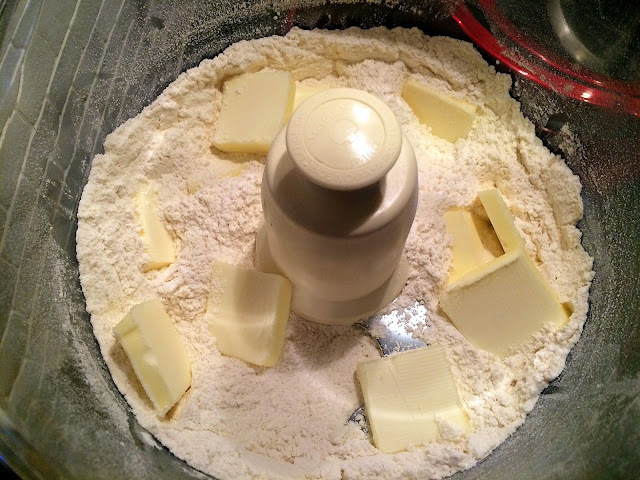 Cutting the butter into the flour can be accomplished quickly with just a few pulses in a food processor. 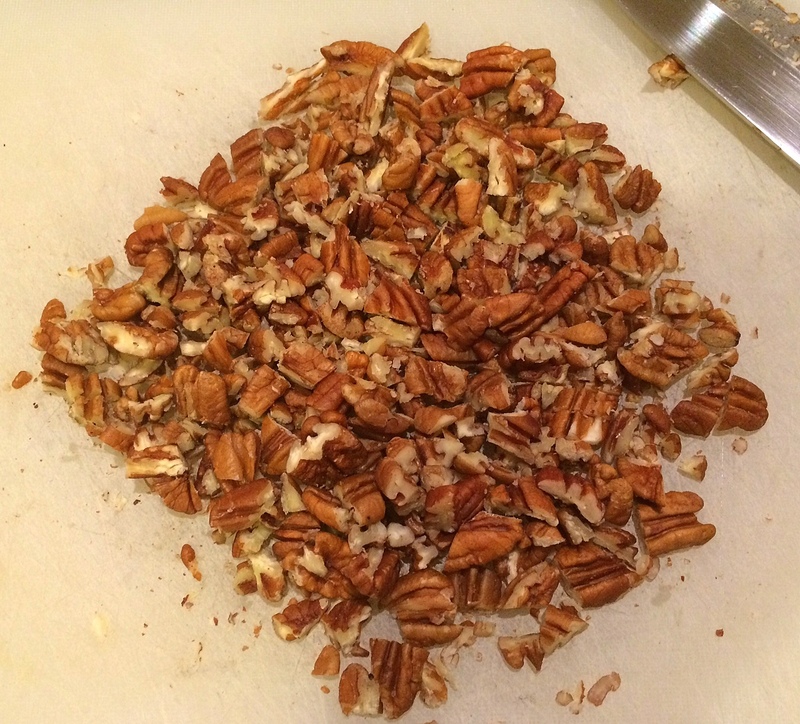 Alternately, use a pastry blender, two knifes or even your fingertips. It should resemble cornmeal (below). 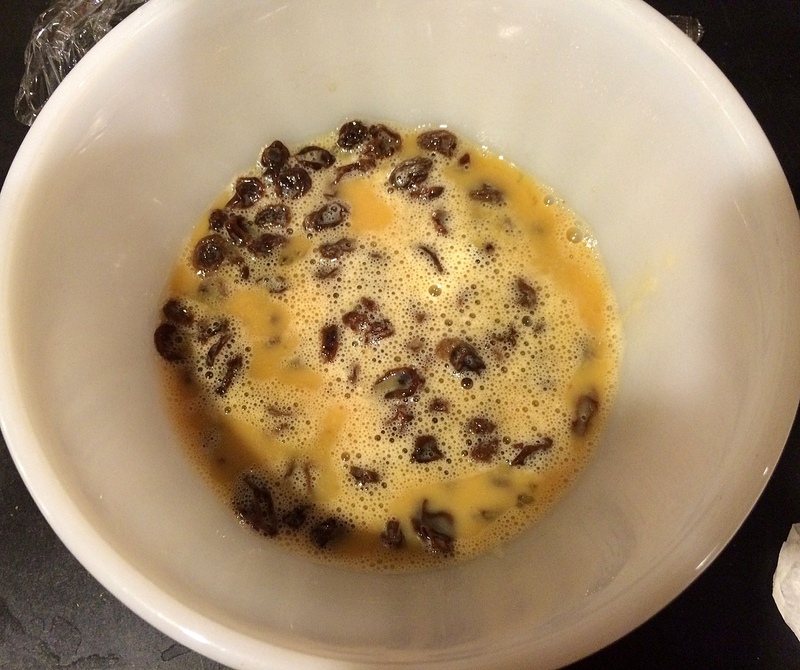 Mix the egg and milk in a measuring up and combine well. 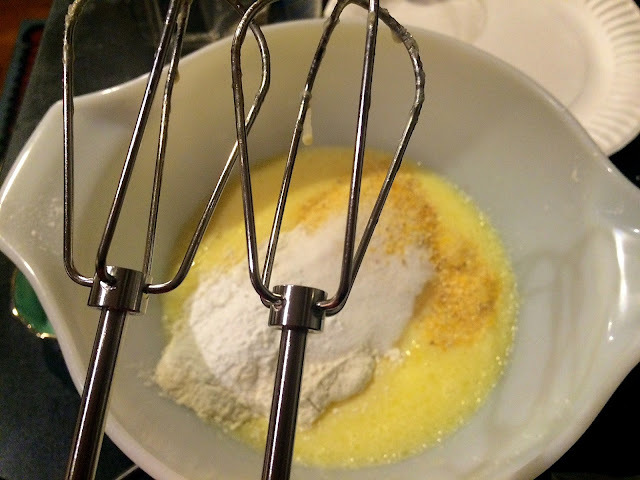 Pour the liquid into the flour-butter mixture and mix until the batter follows the fork around the bowl. 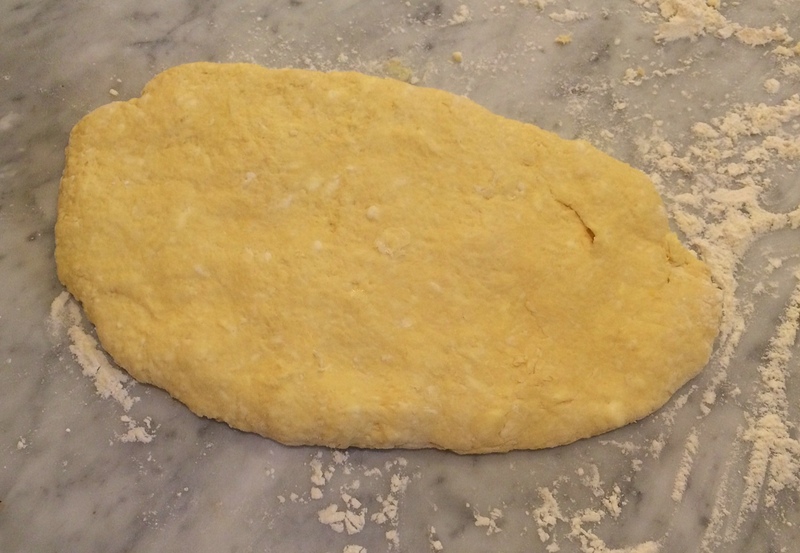 Roll or pat out on a floured surface. Form using a sharp (this is important for the rise!) 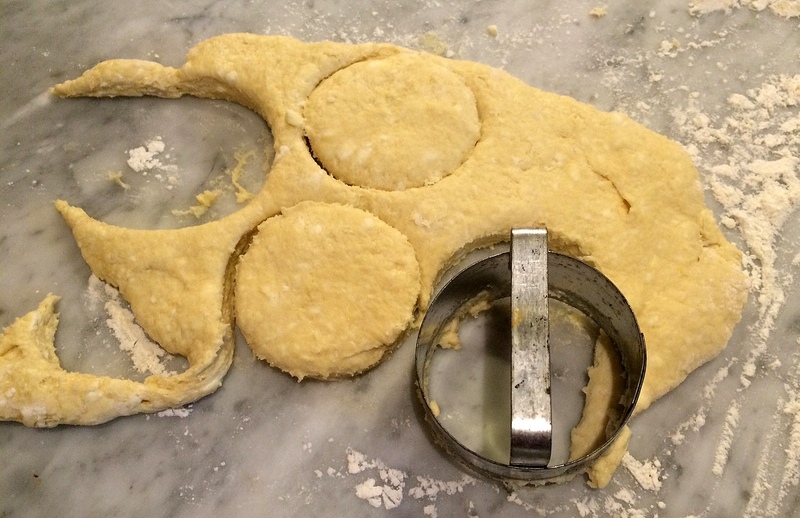 biscuit cutter. 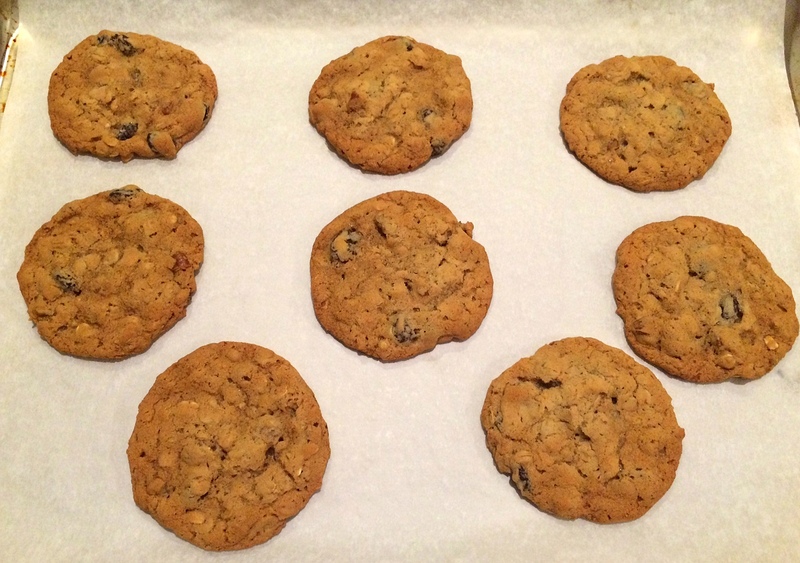 Pop them in the preheated oven and voila! 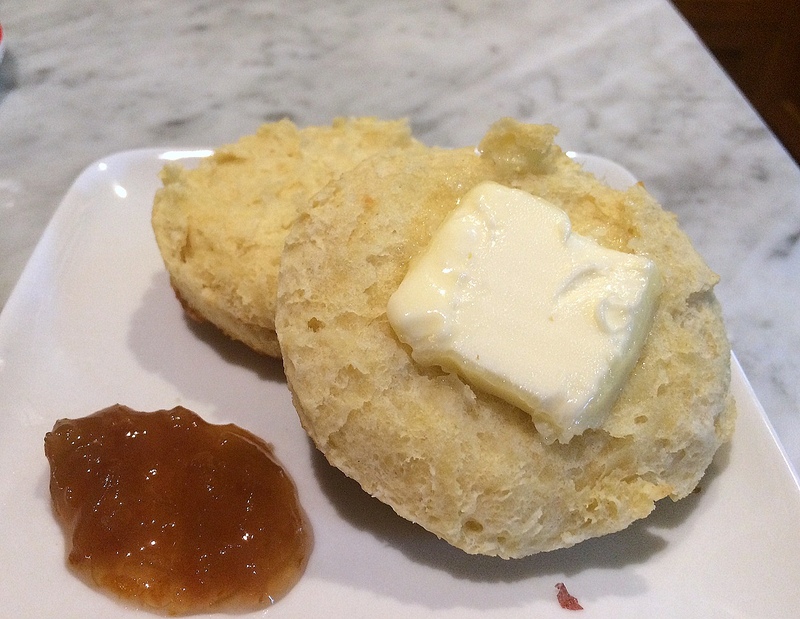 A little added butter and jam make for a delicious breakfast treat. Production notes: I made the smaller amount, and used butter instead of margarine.